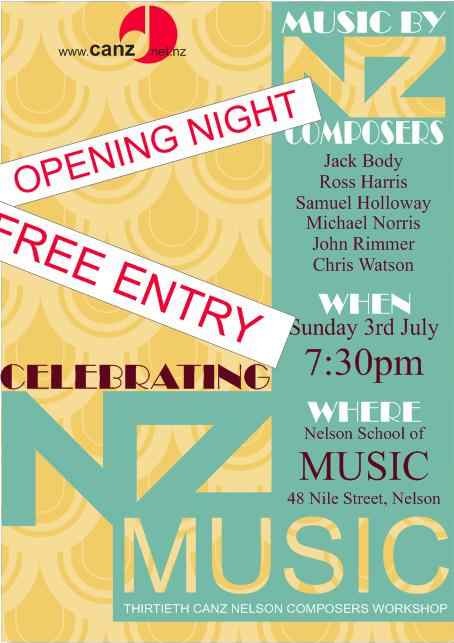 A free concert featuring Auckland ensemble 175 East kicks off the 30th CANZ Nelson Composers Workshop, which runs at the Nelson School of Music from 3rd to 7th July this year. Since 1982, the workshop has been held annually in Nelson (with one exception in 1998 when it was held in Martinborough) and is an invaluable opportunity for young and emerging composers from all over the country to meet and hear each other’s music in the beautiful surroundings of this South Island town. Nelson’s location, separate yet easily accessible from the main university centres, creates an atmosphere of collegial neutrality and a real sense of breaking free from normal routines to focus on new sonic experiences, and to network, learn from and socialise with composers from other parts of the country. Composers submit new pieces to be rehearsed and performed by professional musicians at the workshop, in a process closely mentored by a group of senior composer-tutors. The works are performed in afternoon and evening sessions, to an audience made up of all the workshop attendees, followed by open discussion about the piece by the composer, performers and audience members. The workshop always opens with a concert, often featuring work by New Zealand’s leading contemporary composers, and this year is no exception. The programme includes works by Jack Body, Chris Watson, Samuel Holloway, John Rimmer, Michael Norris and Ross Harris, all of whom will be composer-mentors at the workshop. 175 East is a professional new music ensemble based in Auckland, whose members have long supported the Nelson Composers Workshop, rehearsing and presenting submitted pieces in the workshop sessions, and sharing specialised knowledge of their instruments. The group comprises Ingrid Culliford (flutes), Gretchen La Roche (clarinets), Andrew Uren (bass clarinet), Tim Sutton (bass trombone), and Katherine Hebley (cello) for its Nelson concert, directed by Samuel Holloway. Anton Killin and Carol Shortis, both from Wellington, are Conveners for the workshop this year. They would like to extend a special message of thanks to the Nelson School of Music for hosting the workshop over the last three decades, to the McKee Trust for their long-standing financial support, and to the people of Nelson, who are invited to the free opening concert on 3rd July, 7.30pm in the Auditorium at the Nelson School of Music. The workshop is funded by Creative New Zealand, CANZ The Composers Association of New Zealand, McKee Charitable Trust and The Marion Rayward Trust. The 2011 opening concert receives sponsorship from Seifried Wines.